and its deepest mystery probed?
. . . We still and always want waking. I'm late to the party, again. 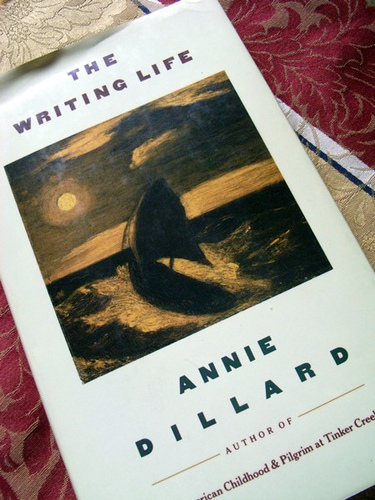 I just now read The Writing Life by Annie Dillard. It's a stellar collection of essays, and is considered a sort of writer's manifesto. When writers gather, it is this book they quote, or worse — for the uninitiated like me — they give a subtle nod, a slight gesture to suggest their knowing is so deep as to not require enthusiasm. The seminal work was published in 1989, and I just now read it. I resist hype. If everyone is raving about something, I usually walk away. Examples: maxi skirts, mainstream movies. Exceptions: Fifty Shades of Grey (don't judge, I was curious), and the sale rack at Anthropologie. But more honestly, I confused Annie Dillard with Annie Proulx. When writers trilled over Dillard, my mind hit ignore. I recalled the long slog through The Shipping News, and couldn't bear another grey and dismal tale set in some grey and dismal hinterland. When the book won the Pulitzer, I abandoned my "don't be a sheep" mantra, and embarked on the longest, most laborious, read of my life. But here's the rub: The Shipping News is a novel by Annie Proulx. Not Annie Dillard. All these years, in my haste to gather, read, learn and log, I had confused the two Annies. But wait — the admission deepens. I also confuse the two Richards: Richard Russo and Richard Ford. Both accomplished contemporary novelists. Both with the same dang name. Too many times to count, I have bought and borrowed a book by Richard Ford thinking it was Richard Russo, and vice versa. Just as I am sinking into the couch with book and enthusiasm, I realize it's not "my" Richard, but the other, less favored, one. And don't even start about multiple book covers. How many times have I bought a book by Elizabeth Berg, thinking it was one I had somehow managed to never read, then realized just a few pages in that, yes, in fact, I had already read the book. So, what's the lesson, the message? If you're a writer, pick a unique pen name. Too many Richards confuses dimwits like me. If you're a reader, slow down. Admittedly, I spend much of my life skimming. I call it getting the gist. This annoys my husband to no end. He's a slow, take-it-all-in-and-remember reader. Conversely, I read quickly and retain little, which explains, well, everything. It's a really good book by Annie somebody.